Yohannes Tesfaye was born in Addis Ababa, Ethiopia in 1978. He studied painting at the AlleSchool of Fine Arts and Design at Addis Ababa University, graduating in 2001 with a Bachelor in Fine Art. After graduation, he travelled to Moscow where he studied at the Surikov Art Institute. Upon return from Russia, he became a workshop instructor at Addis Ababa University. In 2005 Yohannes moved to the United States. His work experience is diverse - from creating illustrations for children’s books at Macmillan Publishers to restoration of wall frescoes for Addis Ababa Holy Trinity Cathedral. Yohannes Tesfaye focuses on two and three-dimensional paintings in acrylic, oil on canvas, wood, fiberglass and a variety of mixed media. His paintings reference African traditions and culture. 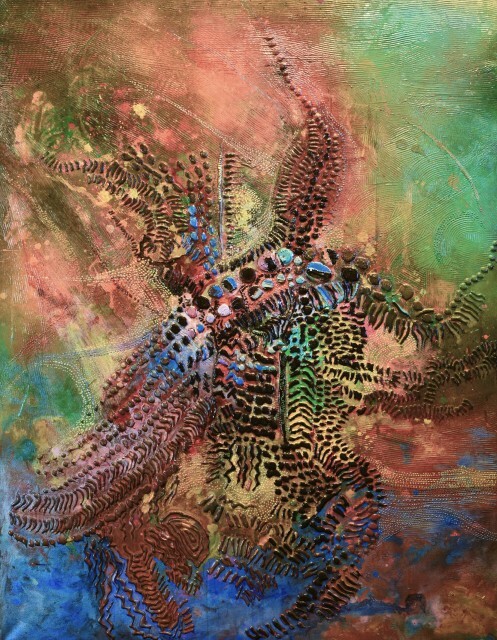 Using contemporary materials and techniques, his current work examines the practice of ritual tribal scarification in a twenty-first century artistic and historical context. The practice of scarification is common to many African cultures, including Ethiopia. This form of body-modification has fascinated the artist for many years. He has admired the various marks he has seen both for their aesthetic quality but also for what they symbolize. This ancient cultural activity also has a functional quality in that it transmits complex messages about identity and social status. Permanent body markings emphasize fixed social, political and religious roles and are used to indicate rites of passages. This series is an exploration and celebration of this custom. The surface of the paintings is textured with a pattern of “scars” reminiscent of the body decorations. For Yohannes this practice whereby a gash is made in the skin using a sharp instrument and the raised scars the cuts leave behind represent both beauty and courage. It is a long and painful process which demonstrates the wearer's bravado. Now it is a tradition that is gradually beginning to disappear and being abandoned for reasons both valid and obvious but Westernization is also playing a big part in the changing attitudes towards this ancient tradition and Yohannes felt strongly about immortalizing it in his Beauty and Courage series. Yohannes regularly exhibits his works in national and international solo and group shows. He currently lives and works in San Diego, California.